With the passing of 2017, the Israeli Ministry of Finance reviewed the past year in the real estate sector in Israel. According to the data, 2017 was one of the weakest years in the last decade, as regards the number of “market prices” transactions. The total number of transactions at “market prices,” that is, apartments not sold under the Ministry of Construction and Housing’s “Buyer’s price” programme, stood at 93,800 apartments, a decrease of 14% compared to 2016. This is the lowest level since the 2011 social justice protests. Summing up the year, the weight of investors in real estate purchases declined, amounting to only 17,400 apartments, a sharp drop of 22% compared to 2016, following a sharp drop of 29% in 2016 compared to 2015. It should be noted that this is also the lowest level of investors’ purchases since 2003, a year which stood in the shadow of economic recession. The total number of apartments purchased by foreign residents in 2017 totaled 1,700 apartments, a sharp drop of 25% compared to 2016, following the sharp drop of 32% in 2016. 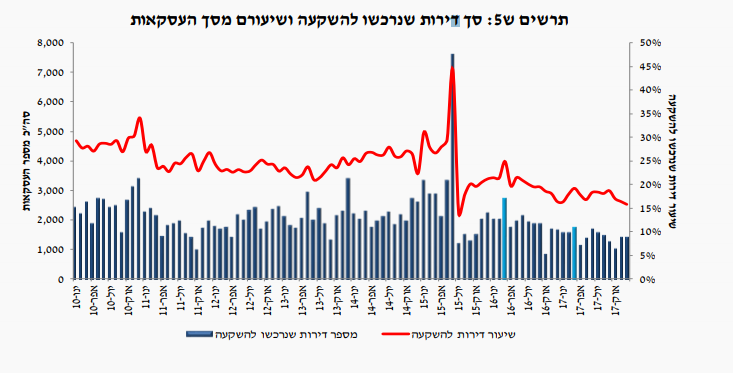 It should be noted that this is also the lowest level of purchases made in Israel by foreign residents since 2002. A geographic breakdown conducted by the chief economist of the Ministry of Finance for the last quarter of 2017, shows clearly that in areas of demand in the center of the country, the number of apartments purchased for investment in the last quarter is closer to the lowest historical level, relative to areas of the periphery. For example, while in the central region (including Ramat Gan, Holon and Petach Tikvah), total investors’ purchases in the last quarter of 2017 stood at only 531 apartments, this was only 3% higher than its lowest historical level. In the northern periphery (Nazareth and Tiberias), the level of purchases by investors is higher than the lowest level, with the last quarter even “located” in the middle of investors’ purchase “ranking” in this region, in historical comparison. This teaches us that the claim that investors are abandoning the real estate market in peripheral areas in Israel is not necessarily accurate.